Mingjun Wei received his bachelor's and master's degrees in modern mechanics from University of Science and Technology of China in 1996 and 1998, respectively. In 2001, he earned a master's degree in mechanical engineering from University of California, Los Angeles. In 2004, he earned a doctorate in theoretical and applied mechanics from the University of Illinois at Urbana-Champaign. He then worked as a postdoctoral associate at Princeton University for two years. From 2006 to 2016, Wei was at New Mexico State University as an assistant and associate professor. He held the endowed position of MAE Academy Professor in 2015 and 2016. From 2013 to 2016, he served as the MAE Department Graduate Director. During the same time, he also served in University Research Council at NMSU. In 2016, Wei came to K-State as an associate professor. He holds the Harold O. and Jane C. Massey Neff Professorship in Mechanical Engineering. 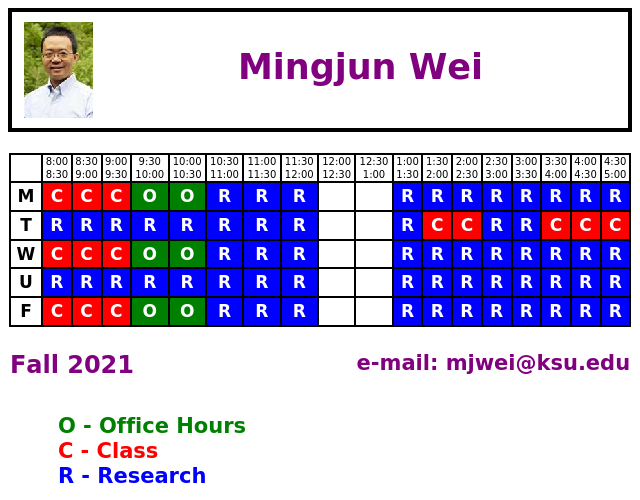 Mingjun Wei runs the Computation Science for Fluids and Acoustics Lab. His research interests are broadly defined, but centered on applying computational science for simulation, modeling, control and optimization in fluid mechanics. His current research efforts include high-performance computation for the simulation of incompressible and compressible flows involving the interaction with solid structures, developing model order reduction methods to apply on complex fluid-solid systems to achieve low order models for real-time computation and autonomous control, and developing adjoint-based approach for sensitivity study and optimization of fluid problems with large control space and moving/morphing solid boundaries. With these mathematical and numerical techniques, Wei’s research group has studied problems with various application background such as flying mechanism of insects and small birds, autonomous control of micro air vehicles, simulation and modeling of underbody blasts, jet noise reduction, etc. Wei’s research has long been recognized and supported by federal funding agencies including Army Research Lab, Air Force Office of Scientific Research and Sandia National Laboratories. In the past 10 years, he has received more than $3 million external funding, mostly as principal investigator. His research resulted in around 50 high-quality publications in top journals and conferences. He has directed eight Ph.D. dissertations and two M.S. theses. Wei has served in Aeroacoustics Technical Committee and Fluid Dynamics Technical committee in American Institute of Aeronautics and Astronautics (AIAA). In 2015, he was elected to the rank of AIAA Associate Fellow.